Experience wine from a new perspective. Join us for a romantic hot air balloon ride over the winery as the sun rises and a new day of your Tuscan adventure begins. Have a private tour of the Avignonesi vineyards and cellars, and enjoy an exclusive wine-paired brunch prepared by our winery chefs. 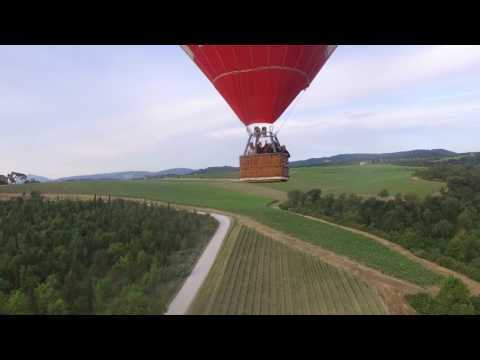 This tour is a collaboration between Avignonesi winery and "Ballooning in Tuscany". Click here for a brief film of the hot air balloon ride. Early morning take off with a hot air balloon from the Avignonesi winery. Approximately 60 minutes flight over the winery, where you will see the iconic La Stella and La Tonda vineyards , immersed in the gorgeous Tuscan landscape, with the towns of Montepulciano, Pienza and Montalcino visible on the horizon. You will landing in the surrounding countryside and a car service will bring you back to the winery. You will enjoy a private tour of the vineyards, appassitoio (Vin Santo drying room), vinsantaia (Vin Santo ageing room) and underground barrique corridor, followed by an exclusive brunch prepared by our winery chefs and paired with 5 premium Avignonesi wines, including the renowned Avignonesi Vin Santo. For more information and for booking your WINE IN THE SKY tour, please contact info@avignonesi.it or info@ballooningintuscany.com.